When it comes to furniture, you have the light stuff and you have the heavy stuff. Things such as big cabinets, sofas, and bookcases can really be a pain to have to move around. This is especially true if you have carpet since it’s a lot hard to slide the furniture around to get a better grip or leverage. Even if you have hardwood floors, it’s not a great advantage either since you need to be concerned about scratching up the floor. 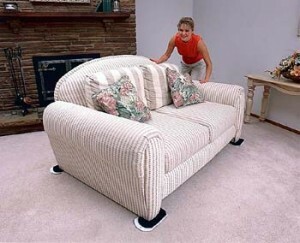 With furniture moving pads, you will be able to easily move your furniture around without too much effort. Whether you want to rearrange your furniture you simply want to move something out in order to clean or get something behind it, if the piece of furniture is heavy enough, this can cause a problem. Not only will it be difficult to move, you will also have the possibility of hurting your back if you decide to lift the heavy furniture. By sliding one of these moving pads underneath the furniture though, you will be able to tuck on the pad itself to move whatever it is you need to move. The reason this work is because the surface of the pads are a lot less rough and will therefore make it easy for you to slide heavy furniture to wherever you want to move them. There are different types of pads that you can buy. For home furniture that is really heavy such as a cabinet that holds your television for example, you might want to buy those adhesive pads that go under the four legs or corners of the piece of furniture. Since the pads are smooth, without much effort, you will be able to slide out things even if they weight several hundred pounds. You can find and buy these furniture moving pads online.